The Cathedral is open daily from 9.30 to 16.30 in the summer, 10 to 4 in the winter. 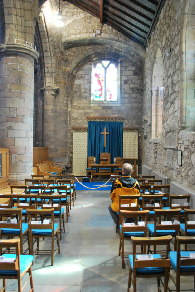 Many people find its tranquil spaces allows them respite and make it easier for them to pray. While most will find their own 'best space', the east end of the south aisle has been furnished with private prayer much in mind. Appropriately this is where the Sanctuary Cross stands, just at the entrance to the Mitchell Chapel. Close by is a stand of candles: the candle flame has been a Christian symbol for centuries. Here too is the 'Prayer Tree'. Some people like to note their prayers (slips of paper are in a wooden alms bowl) and fasten them to a branch. These are gathered up weekly and incorporated in the prayers of the congregation. Near the prayer tree you will also find a prayer leaflet (pdf-file) which can help when finding it to hard to pray. Meets every Monday from 12.30 - 1.30pm in the Gatehouse. All are welcome to come along and join us for a time of stillness and silence. Speak to Anne Ross (tel. 01651 862802) or Val Nesham (tel. 07787244020) if you are interested.